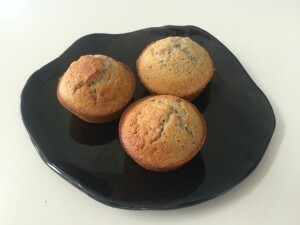 Blue cornbread muffins are a variant on a traditional Southern recipe, made using an heirloom variety of sweet corn with natural blue pigmentation. They are quick to prepare and bake, and not overly sweet as a post-ride or in-ride snack. In Australia, you can buy blue cornmeal at this online store, though the exact brand may vary. You can also use yellow cornmeal, but the blue variety gives a nuttier flavour and anyway, how often do you get to eat blue foods? Preheat oven to 180 °C (convection, not fan-forced). Thoroughly mix together cornmeal, flour, sugar, baking powder and salt using a whisk. Melt butter over low heat and set aside to cool slightly. Beat eggs with honey, then blend in milk. Pour egg mix and melted butter into dry ingredients. Slowly blend together the ingredients with a wooden spoon until the dry ingredients are only just wetted—a few lumps should still be present. It is important to avoid over-mixing if you want the muffins to be light and fluffy. You will find that what appears to be under-mixed batter, thickens in the time it takes to fill into the tin. Spoon mixture into a well-greased muffin tin and bake 17 minutes until the tops are just set. Let cool for 5-10 minutes on a rack, then run a bread and butter knife around the edge of the muffins to help loosen them, and turn them out of the tins. Makes 12. Cornbread is best eaten while still warm, so enlist your husband or a non-riding buddy to have these ready when you get back from your ride.